Living on an island in the Puget Sound, Kim and Ellen Grauer quickly learned that road trips need to be planned: returning in time to catch the ferry back home is a critical factor in everything around there! So when they left for a quick turn-around trip to Portland, OR, about 4 hours south of them, the day began early and the drive afforded lots of talking time. One thing led to another and before they returned home that day, their new careers had been born: it was time to have some fun cooking and producing videos! 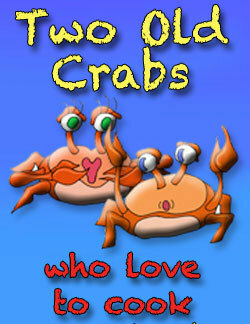 The name Two Old Crabs seemed natural: they're both recently retired (but not old!) and this is definitely the area for shellfish, especially succulent & tasty dungeness crab! He’s the photographer, editor and part-time chef, while Ellen is the daily chef and runs the kitchen. Ellen is from the south, Kim’s family is in the mid-west, they’ve lived in the deep south and southern California and currently live on Whidbey Island so you might say they have a mix-match of recipes. People say they have an awesome collection and can’t wait to try them all! So turn up your computer, sit back and join them on a cooking adventure: it’s always fun to have friends over for dinner!